I admit it. I squealed and started jumping up and down. It startled my girlfriend. "My name is in here!!" I said. I felt exactly like Navin Johnson from The Jerk, when the new phone book arrived. More Rocket Camp posts on the way soon! I'm working on the next Rocket Camp post, but in the mean time, the latest episode of The Rocketry Show is up. This one features John Beans of Jolly Logic, and it's a good one. It's also the Season 2 finale. We'll be taking a hiatus while we book new guests, come up with new show topics, and get some new equipment. Specifically, we'll get a new microphone for me. This is great news, because, if I might make a confession, I hate the way I sound on The Rocketry Show. I think I sound a little nasal, or like my throat is a bit constricted. A lot of people don't like the way they sound on tape. But for me, it's not that. I've done radio, and I'm used to hearing my own voice recorded. But the microphone I currently use to patch in to the studio in Cleveland is a cheap gamer's headset from RadioShack. I can't hear my own voice through the ear phones. Anybody who has ever done radio or podcasting knows it's really important to hear your own voice, so you can modulate what you sound like. It's similar to being in a live band - you need monitors to project your own sound back at you, or you're not going to sound good. People often tell me I have a good radio voice, but I don't hear that when I listen to The Rocketry Show. The new mic I will be getting won't be anything too fancy or expensive, but it'll allow live feedback into the head set, and that will help a lot with the sound quality - at least from my end. 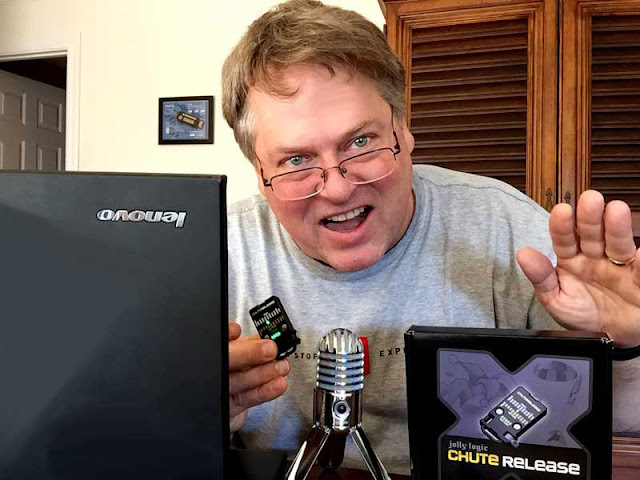 Thanks to show sponsors like North Coast Rocketry, Sirius Rocketry, BuyRocketMotors.com and JonRocket, we've been able to cover the costs of podcast hosting and the web site, and now we'll get to upgrade some of our equipment. Season 3 should start in October. We'll keep you posted, and may do an occasional mini episode from time to time. One exciting upcoming show I can tell you about - we'll be talking to two astronauts! I can't say who, just yet, but they've both flown multiple Shuttle missions. One is from the earliest days of the Space Shuttle program, and the other flew in the late 1980s/early 1990s. If you like the show, click subscribe, and give us a rating and review on iTunes. Even if you listen to The Rocketry Show through another app, a lot of apps get ratings information from iTunes, and a review or rating on there helps other people find the podcast. And if you get the chance, let our sponsors know you appreciate them supporting the podcast. The Space Potatoes, this year's TARC winners, from Odle Middle School in Bellevue, Washington, are competing in the International Rocket Challenge finals in London today, competing against the best teams from France, the UK, and Japan. 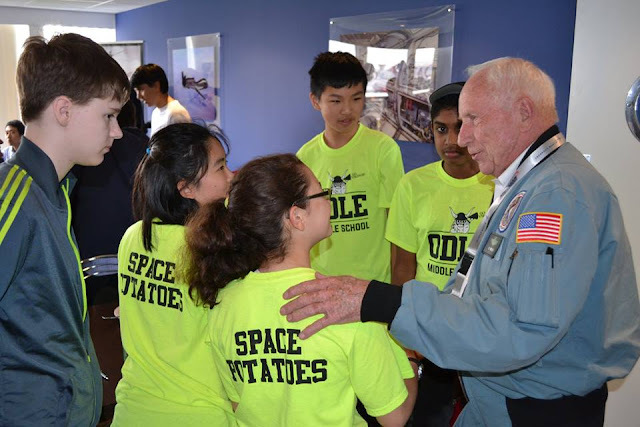 Here they are, meeting Apollo 15 astronaut Al Worden. 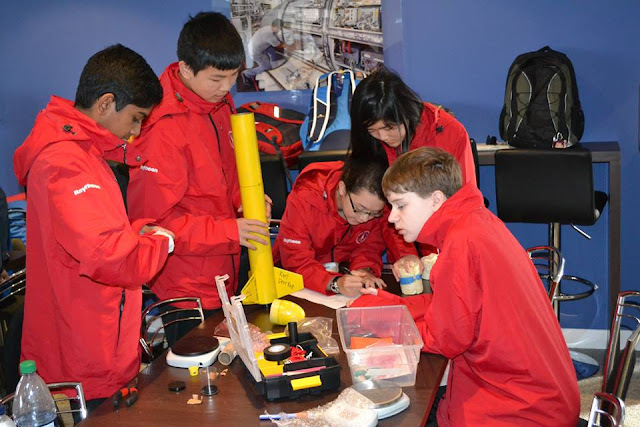 These kids have worked really hard, and have gone far in rocketry at a young age. I'm sure they all have a bright future, and they're an inspiration. 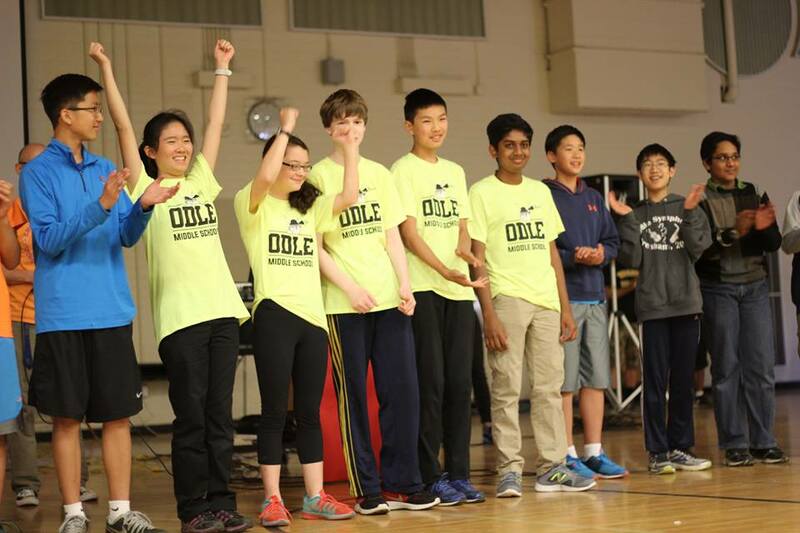 This is a team of 8th graders, and we should all wish them well. I hope we can get a chance to talk to them on The Rocketry Show when they're back in the U.S.
Their name, by the way, is a reference to The Martian. These guys are awesome. Click here for the previous post. Click here for the first post of this series. 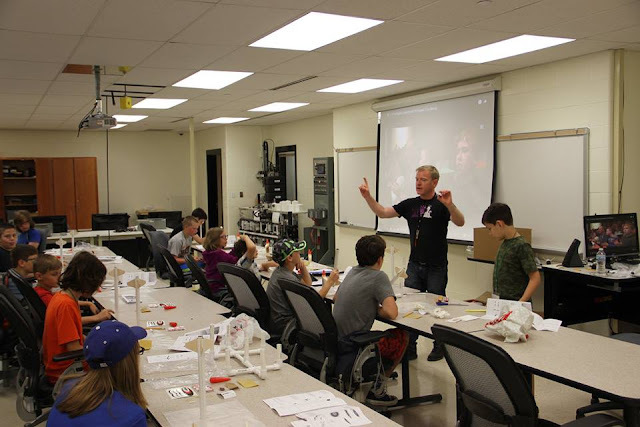 One of the first and most important decisions you'll make when teaching a rocketry camp or unit, be it at a middle school, high school, scout troop or public library will be: What rockets will we build? There are a lot of choices available, and the answer you come up with will depend on the parameters of the class. You'll want to consider the age group of the kids you're teaching, the likely experience level they'll have, and the length of time you'll have with them. The obvious choice for leading a group of kids in a rocketry class is an Educator's Bulk Pack. Most major model rocket manufacturers carry these. Estes and Quest Aerospace, the two biggest, have a pretty good selection of bulk packs, but there are others to consider. Apogee Components has bulk packs of different skill levels, as does FlisKits, and even Balsa Machining Services, which mainly specializes in rocket parts, has a "School Rocket." The School Rocket from Balsa Machining Services. You'll need to decide on the skill level of kits, the type, and whether you want a variety pack with several different designs, or a bulk pack of the same kit. You should also consider the size of the field you will launch from, as well as the surface - whether it be grass, gravel, asphalt, etc. What "Skill Level" means varies from company to company, and even rocket to rocket. There are some Skill Level 2 rockets which are very simple, and some Skill Level 1 rockets which have more parts or require cutting plastic. There's not much rhyme or reason to it, other than that once you get to Skill Level 3 and beyond, it's going to be too difficult and frustrating for first-time builders. D motors, though, and does not come in a bulk pack. I just mention it as an example. If you're working with younger kids or have a limited amount of time - say, a single afternoon - or if you are looking for something simple, for example, to demonstrate some principles of basic physics, then Ready-To-Fly (what Estes calls "RTF," and requires no assembly), or Easy-To-Assemble ("E2X," which requires some very simple assembly) kits will probably be best. 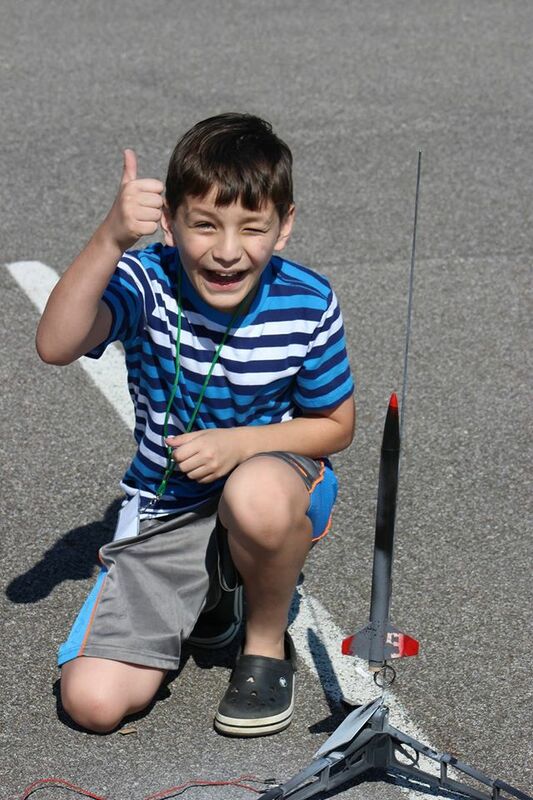 But if you have more time, older kids, kids with more experience, or if you are trying to teach the kids the craft of rocketry, so that they will feel comfortable continuing on their own when they leave your camp or class, you'll probably want to choose something that takes a little longer and a bit more attention to build. When I mention students' experience, I'm not necessarily talking about experience with model rockets. You may be working with a scout troop who have built pinewood derby cars. Maybe you're doing something with 4-H, with a group who have experience with various crafts. Perhaps you'll be going into a shop class or even incorporating rocket building into an art class, with students who are used to using paints and glues. These are all valuable, transferable skills to rocket building. Especially working with glue - your first-time builders are going to need some guidance with glue, believe me! As for type, you'll consider whether to use simple 3-fins-and-a-nose-cone rockets, or something with a payload section, or an "odd-roc" - a rocket which doesn't look like a typical rocket. A saucer is a common kind of odd-roc. Estes Blenders - a type of saucer "odd-roc." These are interesting and don't fly too high. The Blender is a more advanced build. Image from eRockets.biz. Before you choose, try to find the instructions. For most Estes kits, you can download the instructions and read them ahead of time. Same is true for other companies as well. That way, you can see if you'll need any special tools. You might find a so-called "Skill Level 2" rocket which you like, and which in fact is pretty simple to build. You might also find Skill Level 1 rockets you'd rather avoid. Whether you get a variety pack or a bulk pack of all the same rocket will also depend on the factors I've mentioned above. Younger kids and inexperienced builders will need some guidance. If you simply hand them the instructions and let them have at it, they will very likely build too quickly. Some kids don't have the patience to let glue dry on certain parts, and you might end up with a class full of rockets with iffy construction. When in doubt, I'd recommend everyone have the same kit, so that you can build with them, step by step, and you can guide when it's time to set the parts down to let the glue dry while you do something else with them. Finally, consider the size and type of field you will launch from. If you're flying on a small field, you'll either want a rocket that doesn't go too high (which is largely due to the motors you use, but will also depend on the rocket - a lightweight, thin rocket will fly much higher than a fatter or heavier rocket), or you may want to select a rocket that uses streamer recovery instead of a parachute. If you're likely to land on a hard surface, such as rocky ground or asphalt, you'll probably want to go with parachute recovery*. Whatever kits you decide on, I highly recommend building one yourself a few days before class begins. A lot of experienced builders will modify their rockets slightly, changing out the shock cord for another material, for example. But I would suggest you build according to the instructions, as the kids will build. This will alert you if there's anything you need to be on the lookout for. Are there parts which don't fit together just right? Does it come with a two-piece nose cone which requires plastic cement? Do you have to make your own parachute, and if so, how tricky might it be for little fingers? These are the things you'll want to figure out before you get into the classroom. It's also nice to have a well-built demonstration model to show the kids on the first day. It can be hard to visualize what a pack of parts can really look like when it's assembled, and most bulk packs do not come with a face card with a nice photo of the rocket. I went with Skill Level 1 kits, preferring balsa fins over plastic or card stock. *In my case, I had both a small launch area and asphalt, as we launched from a parking lot. The lot would be coned off, but there were still cars parked in the vicinity, and there was the community college roof to be concerned about, not to mention a busy road not too far away. My biggest concern was that road, and though we could launch pretty far back from it, I decided I'd need to keep our altitudes to about 300-350 feet with parachute recovery. Launch site in the upper left corner lot. 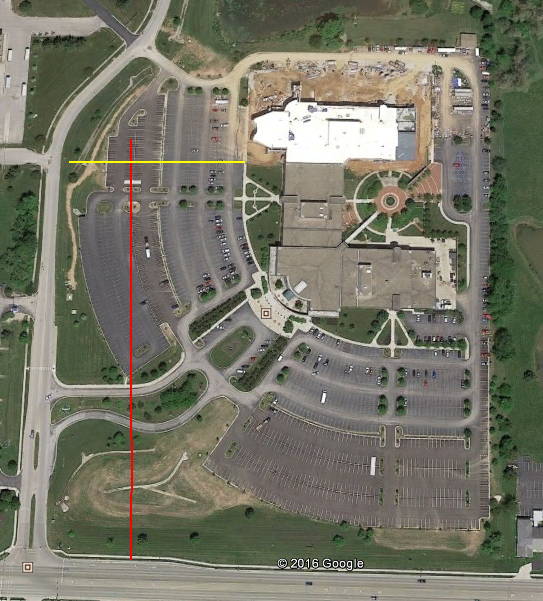 We could be nearly 1000 feet from the busy road at bottom, but the width of the site was only about 450 feet. Sometimes there were cars parked next to the building, so we had to pay attention to the wind. I had suspected last year that I'd need all the kids to have the same kit. My suspicions were confirmed after the Estes Alphas I had requested did not arrive, and the first week kids each ended up with different rockets. It was great that they got to build whatever they wanted, but it meant I couldn't guide them through it. There was the issue of kids using too much glue, or trying to stuff a motor mount into the back of a rocket before the glue was dry, or the one kid who glued on his launch lug directly in line with one of his fins, so that the rocket wouldn't be able to go onto the launch rod. (We pulled that one off before the glue had totally dried and got it in the right place, but I might have missed it). For the second week, we got a pack of the Estes Viking, because it was available at a local hobby shop. 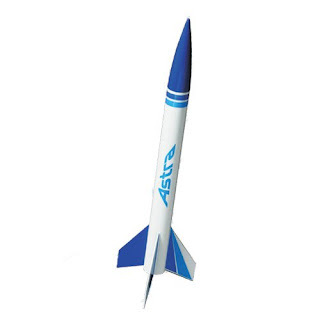 This is a nice little rocket with card stock fins, with a wide variety of fin configurations. Kids could build with three, four, or five fins, and they could be attached in a variety of directions, so that each kid could make a slightly different rocket. (Balsa fins must be attached with the wood grain parallel to the fin leading edge, so there is only one right way to attach a balsa fin). The Viking is what's called "minimum diameter." It's very narrow - only as wide in diameter as it needs to be to accommodate the rocket motor. Narrow rockets have less aerodynamic drag than larger-diameter rockets. That means they can fly very high - which kids love, but which cost me some money (I'll explain when we get to altitude tracking)! Fortunately, they weren't likely to drift too far. The Viking uses streamer recovery, which isn't ideal for asphalt, but with such a lightweight rocket, hopefully we'd get them all back with minimal damage to the fins and body tubes. One drawback to the Viking is that the rocket has no motor hook on the back. The motor hook is really convenient for kids, because it snaps into place and keeps the motor from falling out the back of the rocket. The Viking requires a "friction fit," which means you must wrap masking tape around the motor until it's nice and tight - just tight enough that it won't fall out when the ejection charge fires, but not so tight you can't get the motor out and put a new one in when you're done. It's a very fine line, and one I still have a bit of trouble judging. Kids will sometimes have a motor fall out at apogee, or never be able to get the used motor out without damaging the rocket. Also, because the rocket is minimum diameter, it has no motor mount - the body tube is the motor mount. I really wanted to show the kids as typical a model rocket as possible, with all the parts they're likely to encounter on most builds. My solution was to put together a quick scratch build, a rocket I called Sounder II. It had all the basic parts, but I didn't glue the motor mount into place until after the first day. When I was showing the parts of a rocket on day one, before launching, I pulled the motor mount out of Sounder II, showing the centering rings, thrust ring/engine block, motor hook, etc. I then glued it in, showing how this was done. Sounder II also turned out to be very useful later in the week when talking about stability and rocket design. And it flew very well. It's always good to show kids a few scratch builds - scratch building was pretty standard in the early days of model rocketry, and it's a good confidence builder. A kid who understands stability and how a rocket goes together should eventually be able to learn to design and build his or her own. Sounder II, with markings for the center of gravity (CG) with an A8-3 motor and a C6-5 motor. rocket is stable with the A, and marginal with the C. This will come back later. On week 3, I went in a different direction - the Quest Astra. This year, I went in a different direction. Hoping to avoid any purchasing mistakes, and wanting to make sure I selected a rocket which any of the more experienced kids were unlikely to have built before, I turned to Apogee Components. We built the Apogee Avion. Apogee has a number of great bulk packs. 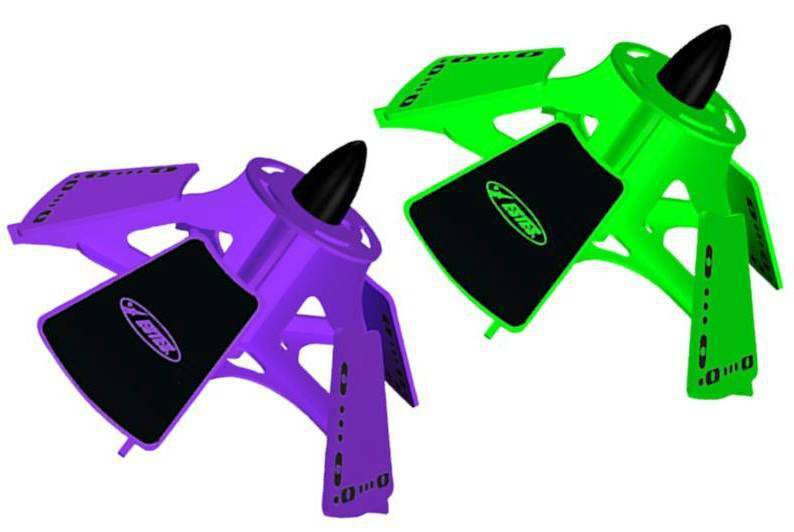 They're not the cheapest you'll find, but they have a variety of great kits, both of their own and from Quest Aerospace. They carry simple rockets, like the Avion, which has balsa fins, and the Apprentice, with a single-piece plastic "fin can." They also have payload-carrying rockets and even a two-stage bulk pack for the truly ambitious. Another nice thing about buying bulk packs from Apogee is that you can download a free RockSim file for each rocket they sell. This will allow you to show the design file on rocket simulation/design software, such as RockSim, which is sold by Apogee Components, or OpenRocket, which is free. With simulation software, you can get a rough estimate of how high the rocket will go with different motors, and you can also use it to demonstrate principles of model rocket stability, aerodynamics, and design. I had thought the Avion looked like a cool little rocket for some time, so I ordered those. As I built the demo model, I discovered a few things. The nose cone came in two parts, so we'd need plastic cement. The shock cord is Kevlar, and is supposed to be anchored to the motor mount. The Kevlar shock cord is also pretty short. A short Kevlar shock cord can be a problem. Because it's not elastic, Kevlar can actually damage the rocket. If the parachute ejects when the rocket is moving too fast - either due to a motor delay which is too long or too short - the force of the parachute opening can pull the shock cord back against the opening at the top of the body tube. Because it is so stiff, this can cause the shock cord to rip through the body tube, causing a long, jagged tear known as a zipper. A zipper - a jagged tear down the body tube of a rocket, caused by the shock cord. Image from an Apogee Components YouTube video. Because I had already known about the Kevlar cord, and I knew some of my students really had trouble with the Quest Astra shock cord last year, I decided we would use some sewing elastic and make an Estes-style paper trifold "tea bag" mount. An Estes paper trifold shock cord mount, sometimes called a "tea bag mount"
Some experience rocket builders don't like the trifold mount, because they sometimes "fail." In fact, it isn't usually the mount itself that fails - it's that the shock cord breaks. 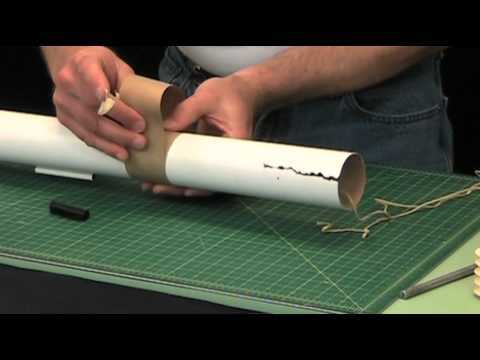 A properly-glued paper mount should be quite secure, because wood glue and white glue are said to form a bond that is stronger than the paper tube itself. In reality, I'm sure a well-glued shock cord mount may occasionally come out, but more often than not it's a failure of the shock cord itself. But first rockets are usually lost or damaged long before that happens. They end up stuck in a tree, breaking because of a poorly-packed parachute, or simply flying so high on a C6-5 motor that they simply "vanish," that an elastic trifold mounted shock cord is probably sufficient. Some elastic cords last decades. Unfortunately, when I stopped in to check everything the Friday before class began, I discovered that the sewing elastic I'd requested had been forgotten. We'd still use a paper shock cord mount, but just with the Kevlar. Mounting the shock cord near the top of the tube would at least give us a little more length on the shock cord, and if there were a zipper, it wouldn't go more than an inch or two down the tube, stopping at the paper mount. These Apogee Avions are nice! They are really great fliers - straight up every time. I don't know what it is about them, but I really enjoyed seeing these things launch. Since they're larger than a rocket like the Viking, they don't go as high, and you can keep your eye on them the entire flight (unless you fly on a C motor - then they're capable of reaching 1300 feet - if you've got a large enough field, go for it! Even on A motors, these are exciting rockets to watch. After building a demo version and one each week with the kids, I now have four of them! In an upcoming post, we'll talk about the building process. Click here for the next Rocket Camp post. When I was a kid, I had a number of science-related and educational toys and kits. I had a chemistry set. I mixed a few of the chemicals in test tubes a few times. Sometimes they changed color, sometimes not. Eventually, I stopped playing with the chemistry set. I still know very little about chemistry. I had a microscope, too. I pulled some hairs from my head, put them on a slide, and looked at how huge they were. I might have even seen some bacteria once or twice. It was pretty cool. Eventually, I set the microscope aside, and hadn't learned that much about microbiology. I also had a telescope, through which I couldn't figure out how to find any stars or planets. I think I managed to focus on the moon a couple times. Not to mention my toy piano and my keyboard. I still can't play the piano. And my model rocket kit? Well, I never built that, because I didn't think I was any good at making things with my hands. 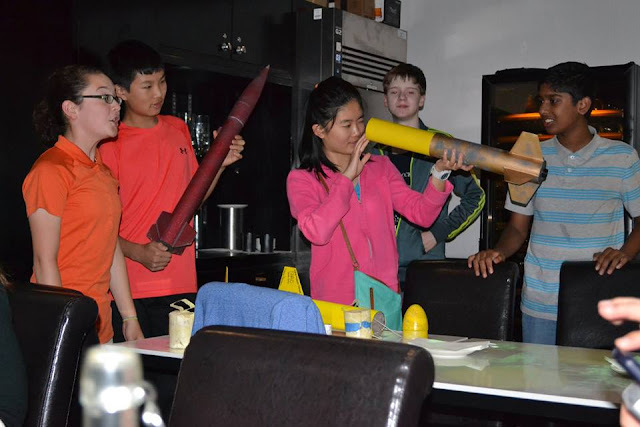 It is often said that model rocketry is a good hobby for kids, because rocketry is educational. It certainly can be, but I would argue that it can just as easily not be. For every Lifelong Rocketeer or Born Again Rocketeer ("BAR") or aerospace engineer who started with a model rocket as a child, there are dozens or hundreds of people who got a model rocket at the age of 11 or 12, had fun launching it for a summer or two, and then got bored just seeing it go up and come down. Their rockets went into a closet or out with a garage sale, and they forgot all about them. For these kids, it was fun for a while, but like me with the chemistry set, microscope and telescope, they never learned what made the rocket do what it did, or what the forces were that acted on the rocket, why some rockets perform better and fly higher than others, what interesting things can be done with model rockets, how to design their own rockets, or how their model rockets related to real space launch vehicles. In what ways are they similar to real rockets? How are they different? To a lot of kids, a model rocket is a fun toy that goes up and comes down, and that's about it. Many kids probably never even learned the basics of the Model Rocket Safety Code, despite the fact that it comes with every kit and every pack of model rocket engines sold. Think of all the appliances you've bought as an adult, where you've opened the box, plugged it in, and thrown everything else out without bothering to read the manual. Educational toys and hobbies are great for kids, but sometimes a little guidance is needed. Some kids are pretty motivated to learn more, but some don't know that there's more to learn or do. Sometimes, a little extra instruction can open eyes to wider possibilities. You can build rockets that fly higher. You can build rockets that carry interesting payloads. You can design your own and you can make them look cool. And there's a little math, too. Think math is boring, kid? A little math can help you figure out how high that rocket flew! It isn't that hard, and it's more fun than just sending it up and watching it come down. My second year of teaching rocket camp is finally done, and I'm back home in Boston. Now it's time to share my experience on this blog. I'm going to try to break this down into bite-sized chunks, over the course of several blog posts, before getting back to writing stuff for total rocket n00bs. This is both for me and for you. A lot happened during the three one-week classes I taught. I got several messages from readers who were looking forward to my stories from rocket camp last year. Immediately after finishing, I moved across the country, and as time passed, I kept thinking I need to write that rocket camp stuff. The more I felt like I needed to do it, the less I wanted to do it, and I never finished the series. Also, as long-time blog readers are aware, I tend to write really long posts. Breaking this down will keep the writing more manageable for me and more readable for you. I'm going to try to keep each post focused on one thing. And it's been a long time since I've written an informative post for rocketry beginners, which is what this blog is intended to be. In between rocket camp posts, there will probably be stuff for rocket n00bs, as well as updates on The Rocketry Show and whatever relevant news items happen to crop up. We'll talk about things I did last year and things I did this year, what worked, what didn't, and how I illustrated certain tricky concepts of rocketry to middle schoolers. I hope you'll find something useful here that you can adapt if you get to teach rocketry to kids, whether it's a one-day demonstration or something longer, like in a week long summer camp or science class unit. Last year, the weather was stormy all week, with a few minor breaks. Ideally, we'd build rockets all week, then go out for a big launch on Friday. That would probably not work, if the weather forecast was to be accurate (which it turned out to be). We would have to try to sneak in a launch when the weather broke, which meant Wednesday or Thursday. It also meant that we couldn't simply go out and launch every day. I would need to fill the 15 hours with some substance. A teacher friend of mine advised me to have more material than I'd think I would need, because if I ran out of stuff to show or talk about, I would struggle to fill the time. The kids would get bored, some of them might act up, and the camp would be not much fun for them or me. Though I tried to "keep it simple" the first week, while still teaching the kids some basics, I realized I needed more material. Over the weekend, I went chapter by chapter in The Handbook of Model Rocketry, and used the headings as a kind of outline. I decided I'd teach the kids everything I knew - or whatever I had time for. If time is limited to one day or less, you may decide to focus only on what makes rockets work (i.e., Newton's Laws of Motion) and safety, and then do a launch. If you have the kind of time I had, though, I say go for it. Here's how class started. I went to collect the kids from the drop off point and brought them down to the class. I wore my NASA shirt with my name badge, and hanging from a lanyard around my neck, I had the bright red safety key for my home-built launch controller. In the classroom, I had a number of my rockets set up on display on the front line of tables, and asked the kids to find a seat. I had the luxury last year of being able to bring all my best-looking, largest rockets. I also had a launch pad set up on the table with a rocket in place. There were a few launch controllers - some from Estes and my own. I introduced myself, told them how long I'd been building rockets (not long), and then went around the room. I asked each kid his or her name and age, and if he or she had ever built or launched rockets before. The answer is often no, but some kids do have some experience. If they've built or launched before, I ask what rockets they'd flown. A lot of Estes kits are mentioned, and some I-don't-knows, and there are inevitably a few kids who mention that they've launched some bottle rockets or other fireworks. The mention of fireworks can raise the hackles of some experienced, safety-minded hobby rocketeers, but I'd advise not to overreact when it comes up. I simply say, "OK, so you've launched some fireworks? Well, here we're going to be building and launching model rockets, which are a little different." Then move on. The subject of fireworks will return when we discuss safety. You certainly don't want to mix the two in a model rocket class, but you'll probably have to have the conversation. After introductions, I briefly show all the parts of a model rocket. There are some visual materials you can download from Apogee Components and other sources to show as slides or print off, but I prefer to pick up one of my real rockets and show each part. Interacting with the kids is key. "This little tube on the side of the rocket is called the launch lug," I said, and then pointed to one kid and asked, "What do you think this is for?" After going over the parts of the rocket, it was time to kick things off with some excitement. "You guys ready to go see a rocket launch??" The answer is always a resounding Yes. If you have a week-long class like this one, I think doing a launch first thing is important. It kicks things off nicely. The kids get excited and motivated to build something of their own, and you may refer to the flight when talking about this or that. And some kids will be very surprised by it. One of my kids last year remarked that she thought the rocket would only fly "about as high as the (street) lamp." Seeing something jump a few hundred feet in the air is a good motivator. We all grab some stuff - a rocket, prepped and ready, launch pad, launch controller - and head outside to our designated area. In my case, we were in a parking lot which had been coned off for me by school security. The launch area wasn't huge. A cheap, small, ready-to-fly rocket is perfect for a first day demo launch. If a fin breaks, your heart won't. No need to overdo it on the power of the motor - most of these kids have never done this before, and launching on an A motor will still thrill them all. You might be surprised that it thrills even you. Even if you are a High Power Rocketeer, the kids' excitement at liftoff is infectious. For me, my go-to first day demo rocket is the Estes Hi Jinks, given to me by my friend Chad when he moved away. It's nearly identical to an Alpha or Alpha III, with plastic fins and a longer nose cone. It can fly very high on a C motor, but does a great job of demonstrating the phases of rocket flight on an A motor. I show the kids every aspect of prepping the rocket at the pad - inserting a motor, installing an igniter and the little plastic plug that holds it in place, hooking up the launch controller. By the end of the week, I'll have them all do this for themselves with their own rockets. I tell them all, "We all need to scoot back fifteen feet!" and we all stand back. "Look over at the flag," I say. "The wind is blowing this way. Which way do you think the rocket will fly?" The kids will invariably indicate that the wind will fly with the wind, in the same direction that the flag is waving. "Alright, let's find out!" I say. At this point, I lift up the safety key hanging from my neck. "This is my launch controller safety key. This ensures I can't launch the rocket while I'm hooking up the igniters. See, pressing the launch button won't do anything if the key isn't in the launch controller," I say, pressing the launch button. "OK, I'm going to insert the safety key into the launch controller." I put the key in, and the bright red LED continuity light comes on. "OK, my continuity light is on. That means we've got a good connection. We're going to do a countdown from 5! Ready?" We all count down 5! 4! 3! 2! 1! Launch! and the rocket zips off the pad. The kids go bananas. So do I. Near apogee, the rocket arcs over into the wind in the opposite direction from what the kids predicted. The parachute comes out, and the kids go chase down the rocket as it lands. That's the great thing about launching with kids - they recover your rockets for you. We go back inside, and the kids have a seat. "So, did you see which way the rocket flew? It turned into the wind, right? We all thought it was going to go the other way, didn't we? We're going to talk about why that happened this week." I said, "This week, we're going to build our own rockets, and we're going to launch them. I'm also going to teach you guys some stuff about rockets, so you can do this on your own. Here's what I am going to show you guys this week." 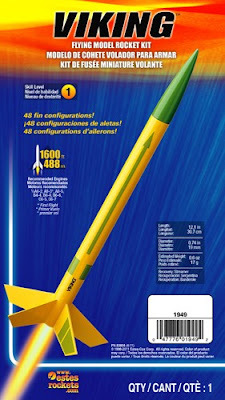 All about model rocket motors - what do the letters and numbers mean, how to pick the right ones, what happens inside, etc. 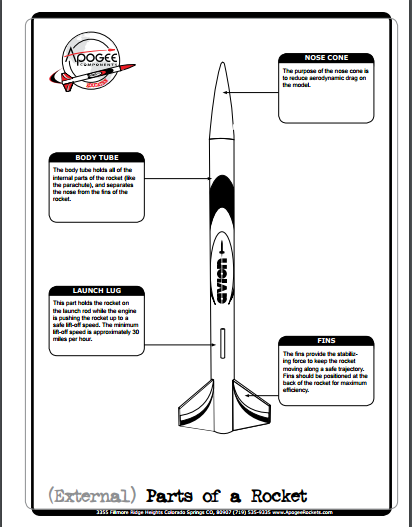 Rocket stability - what makes the rocket fly straight up? Ignition systems - how does a launch controller work, and why do you need one? Now, some people may think this is crazy, especially considering that these are first-time rocketeers, aged 11-14. This is too much. This is too complicated. You need to keep it simple. And what about that thing about High Power Rocketry? These are kids! They can't do that stuff yet! Let me address that last concern first. I want them to know that you don't have to stop flying rockets when you turn 14 or 15. There's more to look forward to. You can build larger rockets, and eventually fly something really powerful if you want to. Also, some of the class time would include waiting for glue to dry, and sometimes we'd be watching videos. HPR videos are pretty cool, and the kids love them. But that's pretty much most of the stuff you'll find in The Handbook. Did I teach it all? No, of course not. I would teach as much as I could, starting with the basics. If the kids seemed to be particularly interested in one topic or another, we'd focus on that. If they seemed not too attentive or not absorbing, we'd stick mainly to a few basics, including safety, and focus on building the rockets and watch some interesting rocket videos. I don't know that I ever got through all of this stuff. But I got through most of it, and I knew I wouldn't run out of material. Besides, kids have been doing this for decades, and they're capable of a lot. 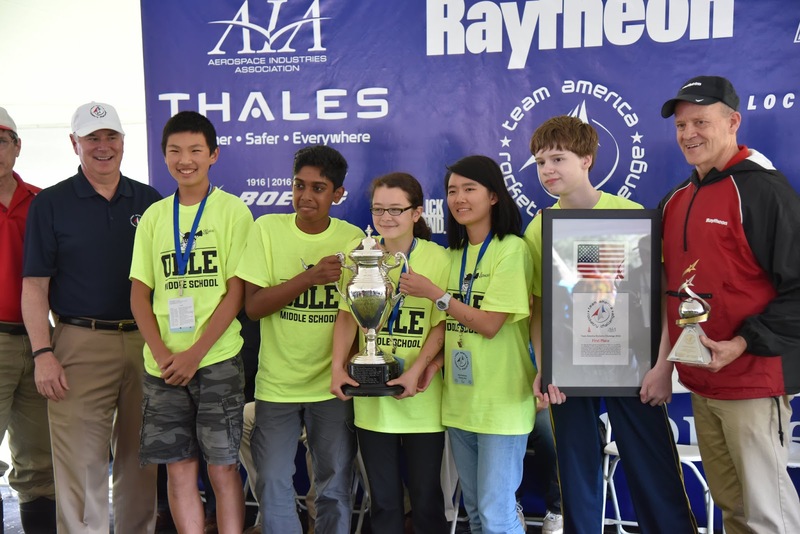 The fact that this year's TARC winners were 8th graders was an added bonus - something to shoot for. The Odle Middle School Space Potatoes won TARC this year. TARC teams design and build their own rockets. The prize was $20,000 and a trip to the International Finals in London, England. They are in 8th grade. 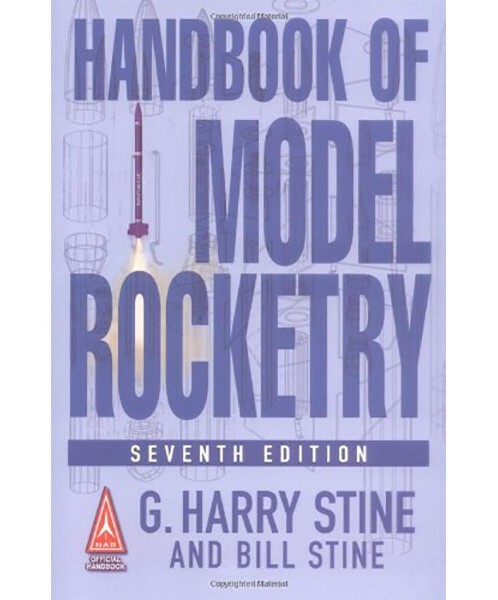 Honestly, I didn't care if these kids became lifelong model rocketeers. But I wanted them to have fun, and to learn a few things. I wanted them to learn a little science - something that would come back when they reached high school physics. I wanted them to learn that maybe doing their math homework wasn't such a bad idea, since there is some fun stuff you can use it for (It may seem like a lofty goal, but I was hoping that in my small way I could contribute to them being better prepared for finding a good job when they're older). I wanted them to learn that they are capable of making things with their own hands. And I wanted them to learn that sometimes there's more than meets the eye - more, for example, to rocketry than simply watching something go up and come down. Rocket camp is done. Weather was great, launches were awesome. I'm working on the posts about the whole thing right now. I'm going to break it down into small chunks, because a lot happened, and I tend to write posts that are too long. Look for the first one in about a day or two.